Are Electronic Learning Toys Right For Your Child? How far should you really go? In a modern world, that probably sounds like an odd question. Electronic learning toys have been around since the days of the Speak & Spell and are so much a part of the life of an American child that we only notice them when they won't quit making annoying noises. However, not all electronic toys are going to be right for you child, for the very simple reason that all children develop in unique ways. Has your child already mastered the skills it is supposed to teach? If your child already knows his ABCs, he's probably going to be bored by a "toy" that keeps repeating them. Instead, he might be ready for a toy that features simple spelling lessons. Is your child ready for it? Everybody wants their child to be a genius, but you wouldn't expect a child to master algebra when he can barely count to ten, would you? If you keep your child's developmental level in mind when choosing toys, you should do okay. Are there too many "bells and whistles"? If your child has trouble processing sensory input (like a child with Asperger's syndrome) or is startled easily, he's not going to want something that makes a lot of loud sounds. That means you wasted your money on a toy he's never going to play with after the first few tries. The toy should also turn itself off if it hasn't been played with for so many minutes so you save on batteries or don't get irritated by a toy that won't quit making noise. Can your child sustain an interest? If he won't play with it for more than a few minutes at a time, it's usually a good idea to find another toy. Scrabble is always a classic if he just isn't interested in that Speak & Spell. Is there any merit in making your own toys? If you've ever played with an empty cardboard box or are a fan of "Calvin And Hobbes," you know that kids are good at improvising toys and games when they're bored. So you don't necessarily have to buy expensive electronic toys. If you are good at programming, you might have been a little jealous of that genius behind "Angry Birds" anyway, so you might program your own Android game for kids. People who are good at crafting might make puppets out of old socks. It all depends on your imagination. Remember that no educational toy will replace your attention. Distracting your child with an electronic learning toy might be okay if you just need to finish doing the dishes, but you should be there to help him master those concepts he seems to have trouble with. Which Electronic Toys Are The Best? Do they actually teach, or just make noise? Okay, so that electronic teddy bear plays snippets of popular kids' tunes, but those tunes might just end up being one of those annoyingly familiar songs that your child can't name when he gets older. A good educational toy should help him develop a new skill without playing "Mary Had A Little Lamb" a zillion times. Can they grow with your child? A good educational toy might start out with the ABCs and move up to basic reading/spelling skills. That helps provide your child with new challenges to keep him engaged. Does your child seem to have trouble mastering it? If so, don't panic and run to your child's doctor. It might not be a learning disability. Maybe he just needs to develop a little bit more before he's ready for that particular choice. If he can turn it on, play with it, and turn it off without giving up or throwing any temper tantrums from pure frustration, that's a plus. Does your child actually play with it? This is the big thing. The "best" educational options won't do the child much good if he doesn't actually use them. So make sure it has plenty of the "fun factor" built into it. Does it get consistent good reviews? Real parents and children are the best judges of what makes a good toy. Places like Amazon are good about featuring reviews from consumers that can give you the good, bad and ugly of any toy. When in Doubt, Go For Customizable. Seriously? There are very few educational toys that can be tailored to your child's specific needs. Android tablets are one of those "toys". Tablets like the one below can be loaded with educational apps that your child can have fun playing with. 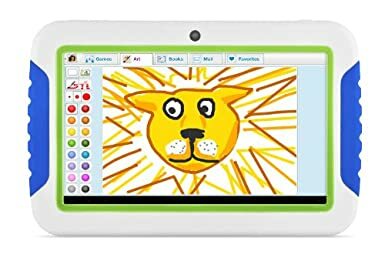 This is a good starter tablet for young kids who are still learning about using electronics. Load it up with favorites, including top educational apps from Google Play.